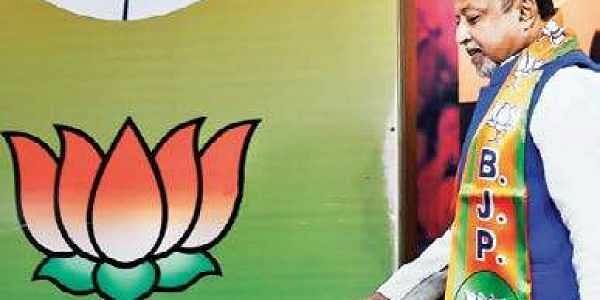 The state BJP unit said it hoped Roy would play a vital role in strengthening the party organisation in West Bengal. KOLKATA: Former Trinamool Congress leader Mukul Roy's entry into the BJP has drawn conflicting reactions, with his new party lauding his organisational skills and former associates stressing he was not a "master strategist" and lacked "mass appeal". The BJP was growing at a fast pace in Bengal and Roy, with his organisational capabilities, would accelerate the growth rate, state BJP president Dilip Ghosh said. Roy, during a meeting with reporters yesterday, asserted he would not indulge in any personal attack but would fight the TMC government. "I can foresee that another change is going to take place in Bengal. The TMC has deviated from its path and the cause it had once fought for. That is why I left the party," he said. The TMC no longer worked for the masses, he claimed. "Rather, it serves the interests of a handful of people,"
Asked about next year's panchayat polls in the state, he said the BJP would do well if the election was held in a free and fair manner and reiterated that the saffron party would come to power in Bengal in 2021. A senior TMC leader, who did not wish to be named, said Roy's departure from the TMC could not be compared with Mamata Banerjee quitting the Congress in 1998. "When Mamata Banerjee left the Congress to form the TMC, she was an established mass leader and a fighter. But Mukul Roy is neither a mass leaders nor a fighter," he told PTI. The TMC leader said Roy would not be able to harm the party and claimed he lacked "mass appeal". Senior TMC leader and urban development minister Firhad Hakim had also said Roy leaving the party would not affect the TMC. "It is a misconception that Roy is a master strategist. but his dreams should not turn into a nightmare for him," the minister asserted. Fearing that Roy, who knows the TMC's grassroot organisation well, might try to lure dissident leaders into the BJP, the TMC leadership recently launched programmes to reach out to them in a bid to prevent any exodus. TMC supremo Mamata Banerjee, during the recent extended core committee meeting of the party, had asked the leaders to take every worker into confidence.